It makes my heart so happy that I get to photograph couples like Monica + Brian and call it “work”. I love that my job is getting to be a part of one of the most special days in peoples lives, and these two have been so wonderful to work with from the very beginning! The day started at the Poughkeepsie Grand Hotel for getting ready preparations and I have to say this was my first wedding where the bridal party was playing break up songs while getting ready BUT when you are channeling some serious vintage Hollywood glam for your hair and makeup, sometimes you just need to belt out a little Adele!! Helllllooooo, it’s m-Monica ... and she looked absolutely stunning! These two opted for a “first touch” instead of a first look and it was oh-so-cute in the stunning doorway of their church, followed by a gorgeous cathedral ceremony. 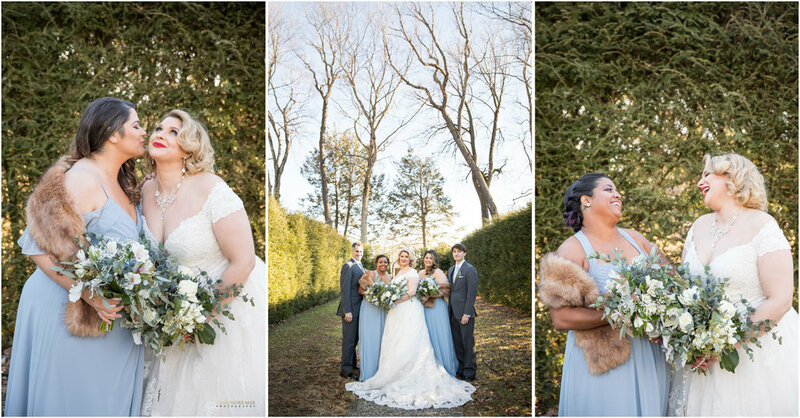 Then we had so much fun braving the cold and traveling around the Poughkeepsie area with their bridal party for portraits! Monica + Brian are a couple that you can truly feel the love that surrounds them, not only in their emotions towards each other, but by everyone that they interacted with on their wedding day! Their reception was filled with so much love and fun as they danced the night away into their happily ever after!